Self Esteem Building T-Shirts: I can ride a BIKE! Congratulations on your child's new achievement! This durable T shirt will sure make your child smile while building his/her self esteem. Think of all the positive reinforcement your child will receive from family and friends! Don't forget to add on first name along with month and year to have it as a keepsake. 100% cotton. 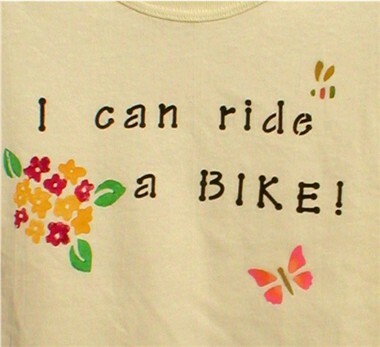 Personalized T-Shirt: I can ride a BIKE!